Duckhorn was a recent stop as part of the Premiere Napa Valley events. And as covered in the recap article, they hosted a dizzying array of top quality food, wine, and people. Almost everything they poured was impressive. 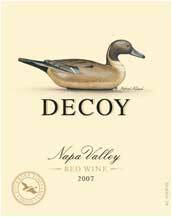 The new Decoy was one of the wines being poured that evening. As impressive as the lineup was, so is Duckhorn's business savvy. They seem to be one of the few wine companies to have gotten the message of new market realities and is responding in positive ways. The Decoy line has not only gotten a makeover, but a price adjustment, too. Yippee! As most wines do, this one tasted better at the winery, but it's still worth picking up. Medium dark in the glass with legs like Brigitte Nielsen, the Decoy has a hot, fast nose. But then the fun starts. Like that cute bridesmaid at your cousin's wedding back in the nineties, the Decoy needs a little time to open up. Once she does, though, she softens and becomes much more accessible. Medium-bodied with some dusty texture, you're not in for anything complex, but something thoroughly enjoyable....just like that bridesmaid. This wine really comes home with food, but is versatile enough to not need it. Probably deserving of a few years in the cellar or a few hours decanted, all-in-all, it's a great entry point to Duckhorn's line up. And priced where it should be - at $25. Clearly you are a connoisseur of the finer things - both in their youth, and in vintage years. But to answer your question - the legs on the Decoy aren't just long, but skinny and racy, too, so...Stallone era, for sure.